There was outrage across the country yesterday following the spate of killings, especially in Benue State where for the second day running, gunmen attacked villages, killing over 13 people. On Tuesday, 19 people, including two priests, were killed in two attacks in Ukor Mbalon Gwer Local Government Area. The first attack was at dawn during a Catholic mass; the second during a burial. Yesterday’s attack took place at Tse Umenger in Mbadwem Council Ward and Mbakpaase in Saghev in Guma Local Government Area, where 13 people were killed, according to Police Commissioner Fatai Owoseni, who spoke to The Nation on phone last night. Also yesterday, seven people were killed in Ihuman village in Awe Local Government Area of Nasarawa State. Killings have been rampant in the area in the last two months. Owoseni said the attacks “have gone beyond herders/farmers clashes or communal clashes”. “It is pure murderous insurgency. These people are enagaged in unconventional warfare and sheer killings,” he said. The police chief said some of the villagers disclosed that the attackers came at about 5 a.m.
A cross section of the villagers confirmed the attack and said people were killed. One of them, Shaapera Nyon, said the attackers came at about 5a.m while most people were still asleep. He said the residents were woken up by gunshots and the cries of agony from gunshot victims. It was learnt that houses were also razed by the invaders. A survivor, Mrs Bridget Ugbuusu, said the attackers were armed with sophisticated weapons. They shot at every door while it was raining and killed many people who tried to escape . “They shot me in the left leg and I fell down; they thought I was dead and later on I tried to escape and they met me again and machete me on my right hand, “ said Mrs .Ugbuusu. She said one of her four children was killed; three are missing. Mrs Ugbuusu, who is at the Benue State University Teaching Hospital, Makurdi, slumped on hearing that her children was killed. Christian Association of Nigeria (CAN), Southern and Middle Belt Leaders, Peoples Democratic Party (PDP), Arewa Consultative Forum (ACF) and fomer Semate President David Mark, among others, expressed strong positions against the killings. CAN called on Chrisians to protest peacefully in churches on Sunday against the killings. 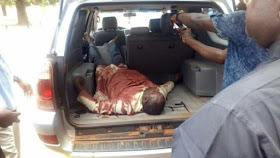 CAN President Olasupo Ayokunle, in a statement by his spokesman Adebayo Oladeji, said Sunday had been declared “a National Day of Protest against unending killings in the country”. The day is to be dedicated “to pray for the freedom and liberty of Leah Sharibu, the remaining Chibok girls and others still in captivity of the Boko Haram terrorists”. “We are already at a breaking point and a state of anomie is almost here,” he said. The Christian body said the protest should be peaceful and done within premises of churches. It urged “the Federal Government and security agencies to stop the unending killings and bloodshed in the country”. “Christians are to carry placards with inscriptions meant to address issues about sustained killings, attacks and destruction of their property.